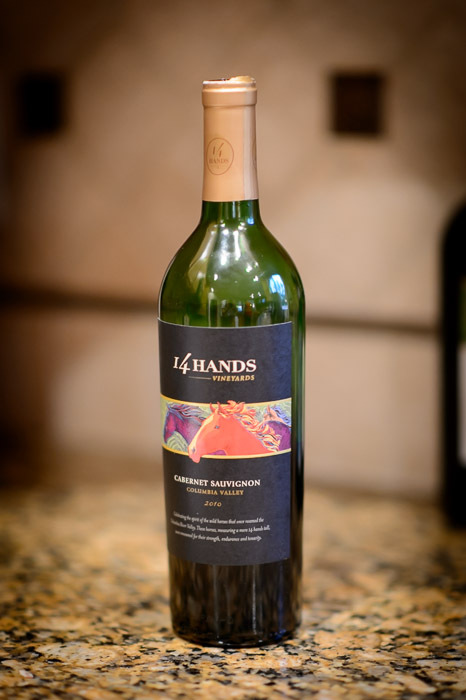 I don't know anything about wine other than “I like” and “I don't like”, and I found out today that I really like this 14 Hands Cabernet Sauvignon. My sister-in-law normally has an educated idea about what wines she buys, but today was in a rush and just grabbed this Washington State wine on display at the front of the store. Apparently it's a fairly cheap (low price) commodity wine available all over America. My sister-in-law thought it was just okay, but I really liked it. I’ve never had the Cabernet but their Hot To Trot red blend is a ~$10 staple. I think they’re owned and maybe operated by the same mega-winery that makes Columbia Crest and Red Diamond , which are also excellent for the money. Woah! I just did a little googling — apparently 14 Hands and Red Diamond are subsidiary labels; all of the wine is made at Columbia Crest . Which is the largest winery in the state and is owned by Chateau Ste. Michelle Estates, which is in turned owned by Altria aka Phillip Morris! A disappointing discovery? As long as the wine is that good and that cheap, I’m okay with it. I tend to trust wine recommendations from people who belong to the like/don’t-like school. I’ll see if I can find your 14 Hands Cab Sauv ‘back east’. I lived in Seattle for a few years and toured both Columbia Crest and Chateau Ste. Michele. Lovely! Anyway, I tried 14 Hands at my nephew’s home and loved it! Then bought the Hot to Trot Red Blend. for $8.99 at my grocery. WOW! I am impressed. GREAT Deal and I know a little about wine. What part of the wine label did you focus on? At “I4 Hands Vineyards,” or the fine print at the bottom?